When the night is dark and dismal the stranger standing amongst the fragments of old walls of Binham Priory would not find it difficult to visualise his eerie surroundings as a setting for a ghost story. The inhabitants of Binham are now discussing the report of the appearance of the "ghost" of a black-hooded monk in the Parish Church which was the nave of the Priory in olden times. A reporter interviewed the Vicar (the Rev. C. F. Carroll) on the matter. The Vicar said that he had been told the story in confidence by a lady of position. Some time ago this woman was present at an evening service in the Parish Church, and saw a figure on a ledge near the church door. She watched the phantom form, which Benedictine monkresembled a Benedictine monk wearing a black cowl, walk slowly along the ledge. After walking along the ledge for the length of the church the spectre disappeared. During its journey the figure is said to have climbed some spiral steps. 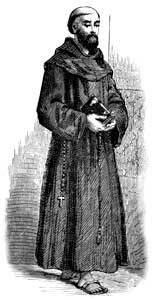 Mr. Carroll indicated the path that the"monk" was reputed to have taken. The ledge is several feet from the floor of the church, and there appears to be ample room for one to walk thereon. Asked if he believed that it had actually happened' Mr Carroll replied that he could not say: but It was possible that it had occurred. He would not go so far as to state that it had not taken place. He could not give the name of the lady who was supposed to have seen the figure, as he was sure that she would not like to be interviewed even if her name was not divulged. The lady was not very imaginative, and while she was certain that she had seen the monk-like figure, as has been described, she feared that the story would be ridiculed. The Vicar added that there were many other people at that service, and it might have been that the other members of the congregation had not the faculty to see in such a way. At a spiritualistic seance only some people saw a spirit appear, and another illustration of that point could be found in the Biblical story of St. Paul seeing the vision and the men who were accompanying him failing to see it. Mr. Carroll went on to say that villagers had stated that they had seen the figure of a Benedictine monk near the entrance to the Priory - the Gaol Gate. Excavation work amongst the ruins of the Priory is in progress, and the Vicar said he hoped that they would find some treasure. After leaving the vicar our representative interviewed a lady in the village, and she related a story which was similar to that told to the Rev C. F. Carroll. It is doubtful however, if this woman was the witness of the recent Visit of the "monk". The woman said that some years ago she was sitting with the choir when during the sermon she saw a dark figure, like a monk, on a ledge in the church. Thinking that she was "seeing double" or that her eyes were playing tricks, she purposely looked away from that part of the church for a few seconds. When she again looked at the ledge she saw the figure. Puzzled, the woman again turned her gaze from the ledge and when she looked at the place for the third time there was no figure there. The lady stated that she had been warned that people must not go near the Gaol gate at midnight.